When I first encountered this soup many years ago in a restaurant, I automatically assumed that it got its name from being something that is commonly served at weddings (duh). 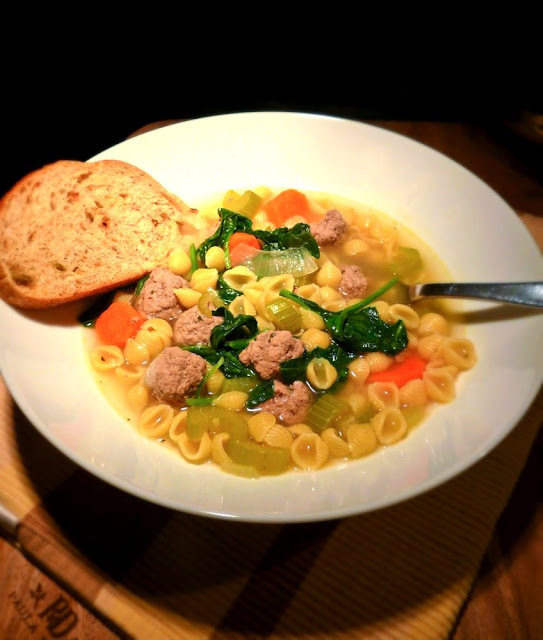 Later on, I discovered that the name of the soup literally translates into "married soup", referring to the harmonious marriage of meat and vegetables in the recipe. Cute name, huh? 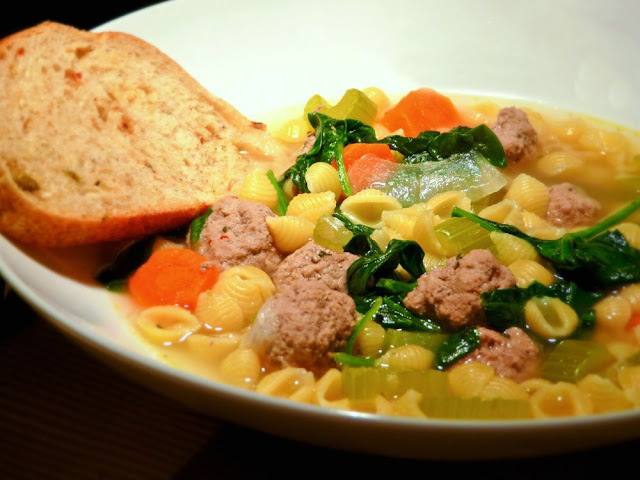 This soup is really easy to whip up in a jiffy. It's also a well rounded meal on its own as it has protein, carbs and plenty of vegetables. It makes for a nice, heartwarming one-pot dish that can be served for lunch or dinner on a cold day and is great with some warm crusty bread as well. In a large bowl, add all the ingredients to the ground beef and mix well. Don't be afraid to get your hands in there as you'll want all the seasonings to be evenly distributed. 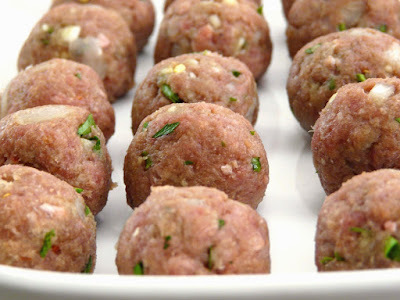 Using the palms of your hands, roll the meat into loose balls about 1 to 2 inches in diameter. Set aside. In a large pot, heat the oil and saute the onion and garlic for a couple of minutes. Add the chicken broth and dried Italian herbs and bring to a boil. Gently drop the meatballs into the pot then cover with lid and reduce heat to low. Simmer on low for about 15 minutes then add the carrots and celery. Cover with lid again and continue to simmer for another 10 minutes until the vegetables have become tender. Finally, add the dried pasta and cook for about 8 minutes until al dente. Stir the Parmesan cheese into the soup along with the baby spinach. Bring to a boil then cover the pot with lid and turn off the heat. Let the soup sit, covered, for about 5 minutes. Serve hot and top with more Parmesan cheese if desired.